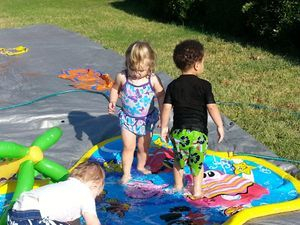 Toddlers are in a unique stage of their development where they want to take off all at once in every direction and experience every sensation the world has to offer. 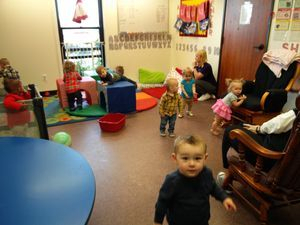 They move constantly and learn best through hands-on play, exploration and observation. But toddlers also need to feel safe and secure in an environment that gives them the confidence to explore. The more secure children feel, the more they are willing to take risks, try new things and make connections with others. Children must be allowed and encouraged to learn and develop at their own pace, when they are confident and ready. We will provide many opportunities to explore new tasks, or to choose the comfort and safety of old favorites. Our caregivers will be partners in your child’s learning. They have a strong knowledge of child development that enables them to provide your child with appropriate activities and experiences to stimulate their growth and development. Your child will have one primary caregiver who will take the time to establish a relationship with your child, enabling them to get to know each child’s individual temperament and preferences. Tuning into these patterns and stages allows your child’s caregiver to give him/her the attention and support he/she needs in the way that will be most effective for your child. Behavior in the toddler years can be challenging for both children and the adults who care for them. Toddlers are struggling to determine where they fit in the world and how far they can go. Our caregivers will set clear and consistent limits, allowing toddlers plenty of opportunities to be independent yet remain safe and secure. Toddlers are beginning to understand what is expected of them, though they may need a few gentle reminders. They need many opportunities to make their own choices and to be in control. Our environment will allow them this opportunity to explore safely, with understanding and attentive adults to guide them. It is especially important for toddlers that parents and caregivers work as partners in each child’s growth and development. There are many issues that will arise this year pertaining to discipline, weaning, feeding, communicating, napping and toileting. Parents and caregivers need to work together to provide continuity for your child between home and school. Please talk to your child’s caregiver about your outlook on the issues facing your toddler. Let us know what strategies work best for your child. We will send home daily reports to keep you informed of your child’s routines and daily accomplishments. When we work together, we provide the best possible environment for your child. Are organized around five developmental domains. Offer differentiated instruction options to meet the needs of all learners. Can be easily infused into daily routines, such as diaper changing, transitions, and outdoor play. Are designed with intention and purpose to move children forward in their development.